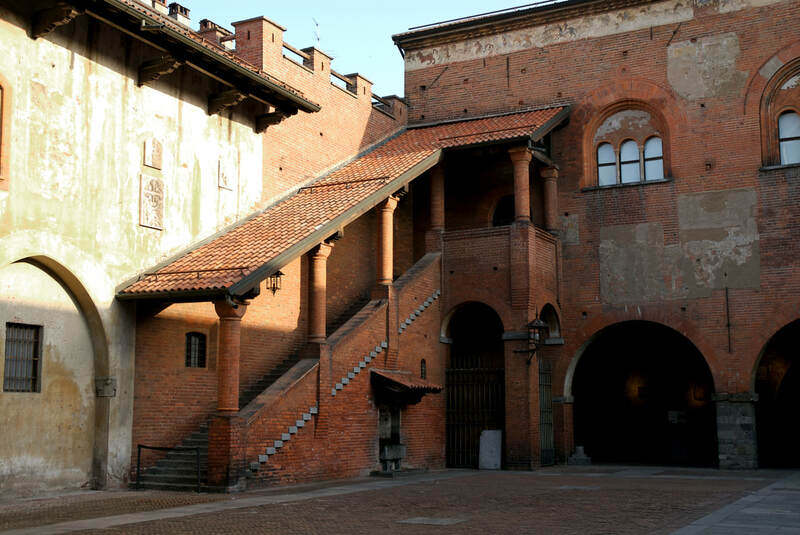 ​The name Broletto comes from the Latin "Brolo", which means courtyard. The Broletto was the centre of the political and social life of the city in the past, starting from the Middle Age. The place is charming for its richness in art styles and for bringing the visitors and passers-by back to old times. 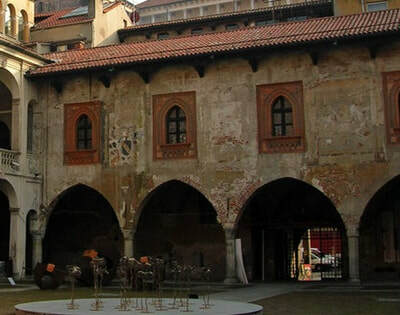 The palaces that surround the courtyard were built in different periods, but there is harmony and balance. 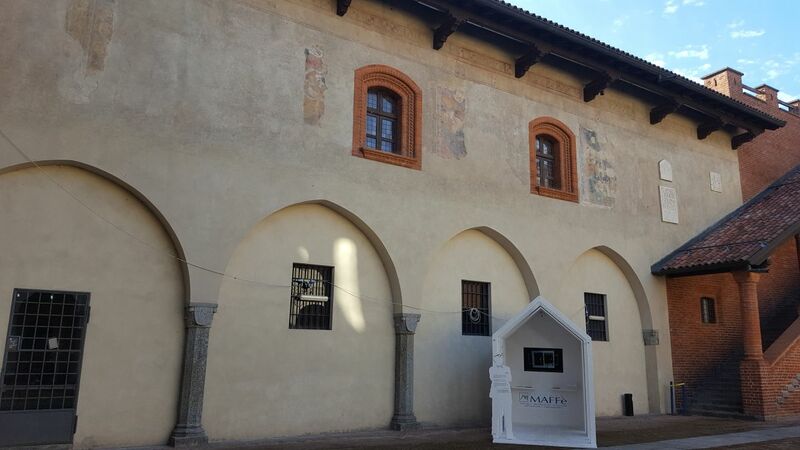 The oldest building is the Arengo Palace, that dates back to the XIII century. 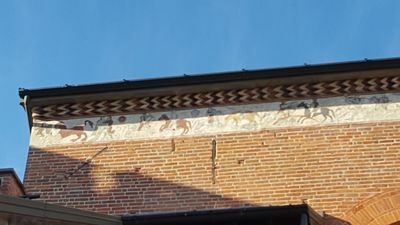 On the higher part of the façade of the Arengo Palace, there is a painted frieze that according to several scholars tells the story of the legendary birth of Novara. The story goes that, in the old times, on occasion of a Jubilee (that is a period of time proclaimed by the Roman Catholic pope usually every 25 years as a time of special solemnity) a young man of royal origins was travelling to Rome from the land of the Franks with his beautiful wife. The journey was long and quite exhausting so they decided to stop for a few days in a place called Casaleggio (a village still existing nowadays, not far from here). They were hosted for a few days by a noble family in their manor. There the beautiful lady fell in love with a young nobleman, beginning a love affair. While the husband was getting ready to leave and continue the journey to Rome, his wife was looking for an excuse to remain in those lands with her lover, so she pretended she was sick. Her husband, who was at the same time self-centered and naive, left for Rome by himself. But when he was on the way he kept thinking about his poor wife, ill and lonely, and felt guilty, so he suddenly decided to go back to her. Unfortunately, once there he caught the two lovers by surprise. In order to run away from the husband’s rage the two lovers sought refuge in a castle not far from there. But the Frank nobleman found them: he was so mad that he set the castle to fire, and ordered his wife to be burnt and her lover to be hanged. 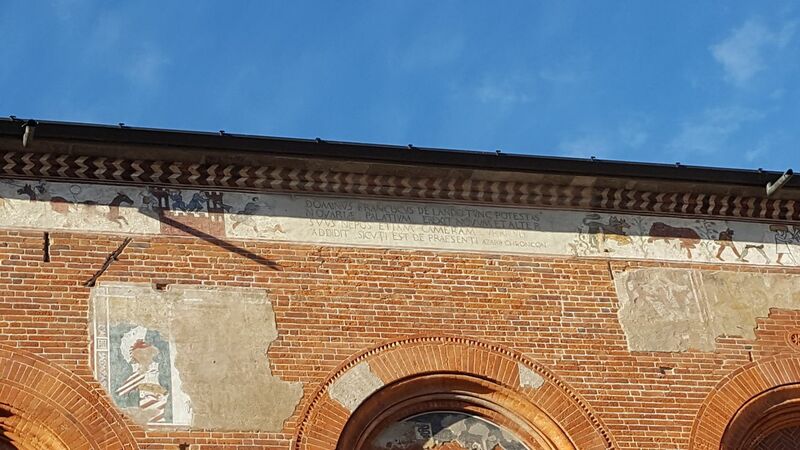 In the old times this sort of things were quite normal, so the pope pardoned the Frank provided he would have built a church in the name of the saints Gervasio and Protasio, in honour of the bishop of Milan, who was the owner of the lands. The church was soon erected on a small hill between the rivers Agogna and Terdoppio. And near the church a new town was established – its name was NOVARIA. Of course this is just a story, reported by the historian Pietro Azario (1312-1366) as part of a propaganda campaign on behalf of the Visconti family and their friends. Anyhow, it contributes to give a romantic and dramatic twist to the story of the city. From now on, when you cross the courtyard, give a glance to the two figures on the left end of the frieze – you will remember what you have just read. Some other historians have given a different meaning to the same two figures: they say that they portray a soldier making love to his girl. The soldier is apparently leaving for war and the act was reckoned to bring good luck and to propitiate victory over the enemies. 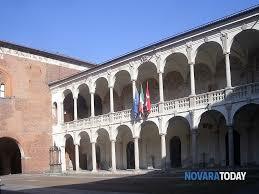 WEST the Palace of the Refendari (XIV-XV century) - it was the palace of the officers working for the Podestà. 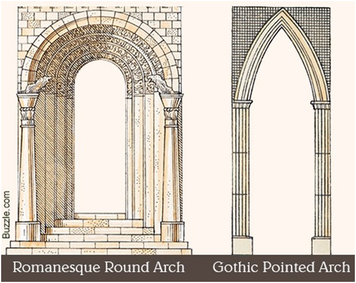 Round arches and Rounded-arch windows are the ones used in Romanesque architecture, and they are the oldest. Pointed arches and Pointed-arch windows (called lancet windows when they are very tall) are the ones used in Gothic architecture. In later years architects copied these two styles, and we still do it nowadays. 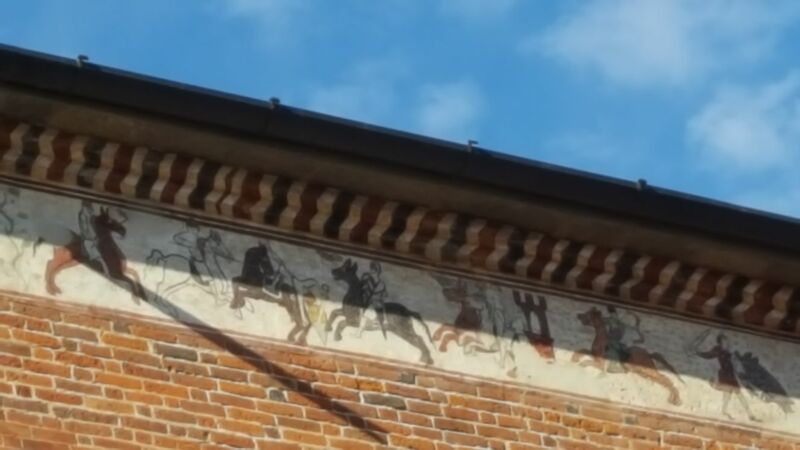 Look around in the courtyard - Can you tell what is old and what is new? In the yard a market took place daily: stalls were placed all around; the town criers made their announcements from a tall stone, and under the arches the consuls of justice had their work benches. The convicts were condemned to the stocks and exposed to public humiliation. 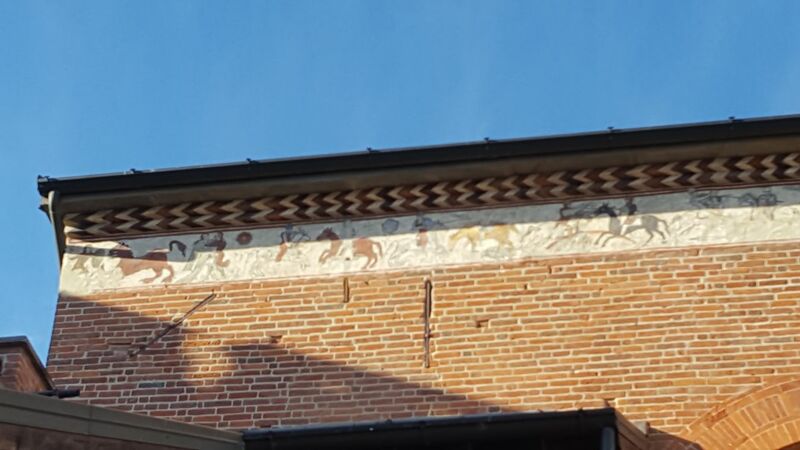 The city taxes were also paid under the north porches, and each neighbourhood and village had a separate table recognisable by its coats of arms, usually depicting various animals such as the bear, the lion, the deer and the eagle. 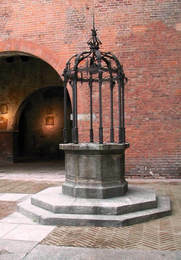 ​In the courtyard you can still find a well. In 1356 the troops of the Marquis of Monferrato occupied the city. The inhabitants of the city and the surrounding villages, especially those from Galliate and Trecate, were afraid new taxes would have been asked by the new rules so, they attacked the Broletto, seized the benches of the notaries, stole the tax documents and threw them into the well. The Broletto complex was heavily damaged in the 1800s, and it was then restored for the first time in the 1920s. For the 150th Anniversary of the Italian unification (in 2011) it was restored and refurbished again to its original state. Some of the rooms now host the prestigious Modern Art gallery “Paolo and Adele Giannoni”. 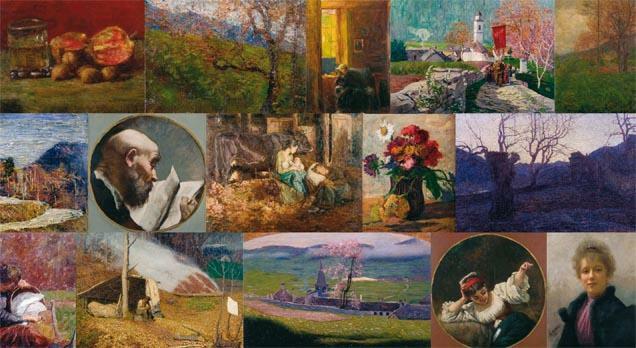 The collection includes paintings of the nineteenth and twentieth centuries, which were donated to the City of Novara by the art collector Alfredo Giannoni, provided that the gallery was named after his parents (entrance to the Gallery is under the north porch).